If you are looking for quick and convenient healthcare that fits your busy schedule, FastMed Urgent Care has a walk in clinic open late in Rocky Mount, NC. Located on Sunset Avenue, FastMed isn’t far from your neighborhood. Our walk in clinic offers extended hours, so our medical professionals are available to address your immediate healthcare needs at your convenience. 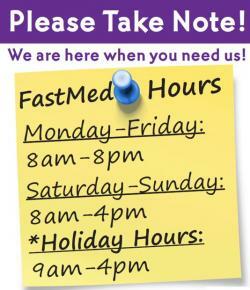 FastMed Urgent Care is open during the week from 8:00 am to 8:00 pm, and on weekends from 8:00 am to 4:00 pm. In fact, FastMed Urgent Care is open 365 days a year, so you can even get the care you need on holidays from 9:00 am to 4:00 pm. If you need a walk in clinic open late, FastMed Urgent Care can provide you the services you need. Whether you’re dealing with an injury, illness, or infection, FastMed can help you get on the road to recovery in no time. Our qualified healthcare professionals aim to get you in and out within an hour. No appointments are necessary, and you may shorten your wait time even more by using our ZipPass online system. ZipPass displays the next available check-in time, which is usually whenever our patient volume is low. If you need immediate care at a later hour, the emergency room is no longer your only option in Rocky Mount, NC. Sunset Avenue’s FastMed walk in clinic is 2open late can treat you beyond normal business hours, whether you have an illness or injury that requires urgent treatment, or you’re just looking for a more convenient time to take care of a routine physical or vaccination. Allow our friendly healthcare providers to handle all of your medical necessities in the most convenient way for you– at a walk in clinic open late and close to home.